Here’s one way of describing the “pre-industrial pig” dinner held in Humboldt Park Saturday night— a secret underground dinner, limited to foodies in the know, in celebration of the pre-industrial pig, showcasing the meat of heritage red wattle pigs raised by farmer Henry Morren, including two-year-cured prosciutto and other meats. Here’s another way to describe it: some caterers from Wisconsin held a dinner in some guy’s apartment for $65 a head. The idea of a secret restaurant operating outside the law, appearing and vanishing in a single night, has obvious cachet for a certain sort of foodie. 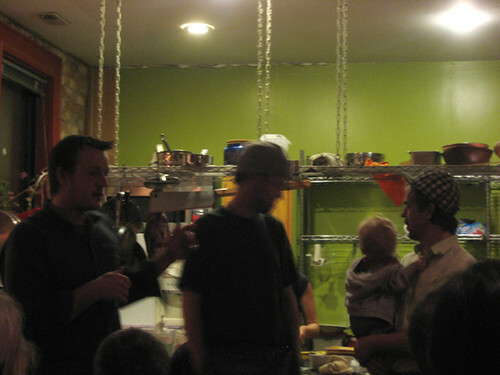 But the reality is, every event like this that I’ve heard of in Chicago has been by licensed caterers; they may be skirting an occasional law (eg., if someone were to serve homebrew along with their food, I doubt that would be legal) but basically, it’s no closer to being a food-speakeasy than your cousin Berniece’s wedding at the Elks Club. More importantly, if a meal like this really struck New Yorkers with the force of the new, then New York must be well behind Chicago in its appreciation for heritage breeds, local produce and the like. It’s certainly nice to attend a meal where the farmer is one of your servers and happy to talk about what he does as you eat the food he raised, but it’s not radically different in that sense from two recent events I’ve been to at Mado, or the mulefoot dinner at Blackbird last November. Many chefs in Chicago work intimately with farmers, base their menus on what’s new and good at the farmer’s market, and so on. Many of them dabble in charcuterie, homebrewing, or similar artisanal techniques. It’s great that these guys do all that, but it’s not redefining the whole dining experience in some way that only an underground restaurant would dare. The underground dining experience turns out to be not terribly different from the above-ground one. Which brings us, finally, to the food. And, well, I’d say on the whole it came out like food from really high quality and thoughtful caterers, but a bit shy of the precision displayed by top-flight restaurant owners who have the discipline born of knocking it out, six nights a week 52 weeks a year. 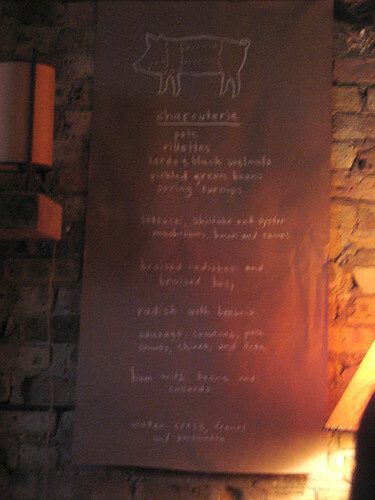 The food was intelligently thought through, some dishes were very good, but there were also executional errors here and there (chewy white beans, overcooked sausage, a too-liquid pate which, it was reported, had to be rescued at the last minute when it fell apart) that you wouldn’t expect to see in a restaurant. In many ways it was more like attending a dinner party by a highly skilled home cook (like me!) than it was like the utterly proficient family dinner I attended a week ago at Mado. In particular, although the red wattle pig meat was of nice quality and generally prepared fairly well, I never quite felt that any one dish took it to an exceptional height, as two or three of the half dozen dishes at the mulefoot dinner did. Closest perhaps was a very simple lardo (only salt-cured) served with black walnuts, an excellent combination. The pate and rillettes were quite good, but both masking the flavor of the meat with a bit too much eager-to-please sweetness. 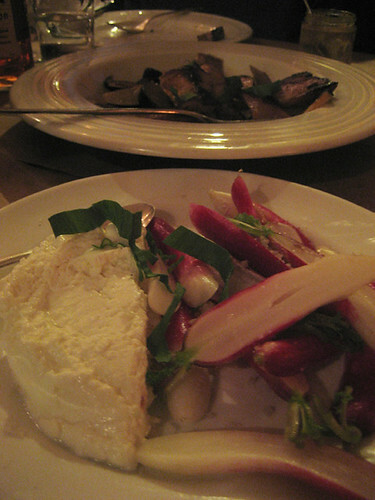 Pork belly with black radishes worked much better together, thanks to the strikingly bitter radishes, than the rather plain pork belly did by itself; same for the ham. There was an odd thing about some bacon (served in a salad) being cured for 18 months, which seems 17 too many by any standard to me, and certainly didn’t manifest itself in a particularly prosciutto-like flavor or any other sign that the extra time had produced extraordinary results beyond very good bacon. And a two-year-old prosciutto was served in such tiny dice in a salad that it was impossible to come to a judgement about how it compared to the La Quercia I’ve recently gorged myself on for an upcoming podcast. In the end, I had a nice meal with some old friends, enjoyed the atmosphere somewhere between dinner party and dining out, and had several things that I thought were quite good. But the outsider mythology that underground dinners evoke— that outlaw chefs might offer experiences beyond what workaday chefs would dare— proves to be a bit of oversell. At least in Chicago, where the good things Underground Food Collective stands for are shared by a goodly number of restaurants serving nightly. Great post! I was there last night, too, and pretty much agree with you. Loved the apartment and the company and the experience 🙂 I’ll be checking back to read more of your posts!